On Saturday I bought some home-made chicken bone broth at the Farmer’s Market. It’s not my normal purchase, but I know it’s good for me and my family to drink, and well, with a lot of sickness going around, I thought it would be good to have on hand. Let me tell you…I’m glad it was ready to go in my refrigerator! When I was finally able to eat or drink, all I could muster was lukewarm Chicken Bone Broth (home made) and raspberries frozen with some water in popsicle form. I’ve made beef broth before, but I find chicken broth to be tastier. Bone broth is one of those “ancient” recipes that are becoming popular again. It’s just so good for your health and we are craving good health! So what’s so great about bone broth? If you are ready to make some bone broth from yourself (please do not buy store-bought bone broth!) here is a recipe for you. Place the bones in a large stock pot or crock pot. In a stock pot, bring the broth to a boil. Once it has reached a vigorous boil, reduce to a simmer and simmer until done. In the crockpot, cook on HIGH for 2 hours then turn down to LOW until done. After a few hours of simmering, remove the impurities that float to the surface. A frothy/foamy layer will form and it can be easily scooped off with a big spoon. Throw this part away. Grass-fed and healthy animals will produce much less of this than conventional animals. About 6-8 hours before broth is done, add veggies and fresh herbs. Remove from heat and let cool slightly. Strain using a fine metal strainer to remove all the bits of bone. When cool enough, store in a glass jar in the fridge for up to 5 days, or freeze for later use. For chicken bones, I recommend 24-48 hours. If using beef bones, I recommend 48+ hours. 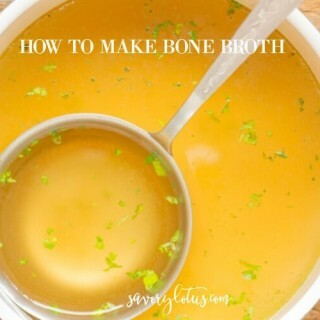 The longer you cook the bones, the more nutrient-dense your broth will be. 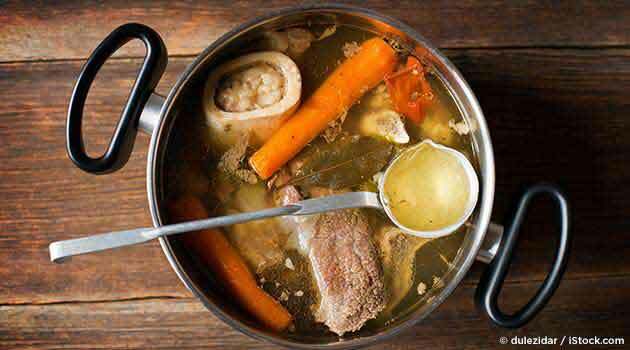 Beef Bone Broth Recipe from .